How To: The Humble THQ Bundle Is Out Just in Time for Christmas—7 Games for Any Price You Want! Over the past few years, indie game developers have gathered together to release their products in the widely popular Humble Indie Bundle, a collection that gamers can purchase for whatever price they want. It's a win-win for both. Developers get more exposure for their games, and customers get tons of games for whatever they could afford. Heck, charities even get a little piece of the pie. While we've previously featured a few of these bundles before, they've mostly been indie games. As the Humble Bundle keeps growing, larger game companies are seeing the value of these pay-whatever packages, the latest being THQ, makers of Metro 2033 and Saints Row. The current Humble THQ Bundle is for Windows user only, and you'll need a Steam account to play. But it's something you can't pass up, since there's 7 esteemed titles and some cool bonus soundtracks for the fair of price of whatever-you-want (there is a minimum price of one dollar, you cheapo). However, there is a catch. You have to pay at least the average current sell price in order to get all 7 games and soundtracks. If you pay less than the average, which is currently $5.60, you won't get the Saints Row: The Third game. 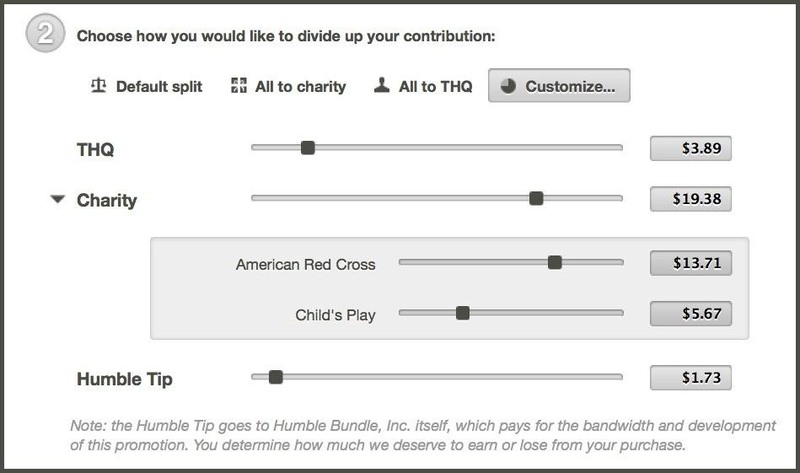 Your payment can be given to either Humble (as a tip), THQ (the developer), or the American Red Cross and Child's Play (charities). You can also split your payment between them however you want. So far, the bundle has been bought over half a million times. You only have 8 more days left to purchase, so make sure to buy it soon. This would make an awesome Christmas gift for any gamer with a PC, so don't miss out. Saints Row: The Third: An action-adventure open-world video game that focuses on the urban gang war between the Saints and the three gangs, with the police also interfering to stop the violence. *Must pay over the average to unlock this game in the bundle*. Darksiders: An action-adventure video game that takes its inspiration from the apocalypse, with the player taking the role of War, one of the Four Horsemen of the Apocalypse. Metro 2033: A first-person shooter video game with survival horror elements from the perspective of Artyom, the main character in a post-apocalyptic Moscow. Red Faction: Armageddon: A third-person shooter video game where the player must reclaim cultist fortifications on the disaster-ravaged surface of the planet and defend colonists from hostile Martian creatures. Company of Heroes: A real-time strategy video game set during World War II. In the single-player campaign the player commands two U.S. military units during the Battle of Normandy and the Allied liberation of France. Company of Heroes: Opposing Fronts: Standalone expansion pack to Company of Heroes. It includes a new dynamic environmental effects system along with new single-player campaigns. Company of Heroes: Tales of Valor: A real time strategy video game stand alone expansion pack to Company of Heroes. Includes new units, additional maps and further multiplayer modes.